FECHA: viernes 11 de noviembre 2016, a las 11 de la mañana en el salón de actos del ICMAB. Secretaria: Ángela Sastre Santos. Catedrática de la Universidad Miguel Hernández. 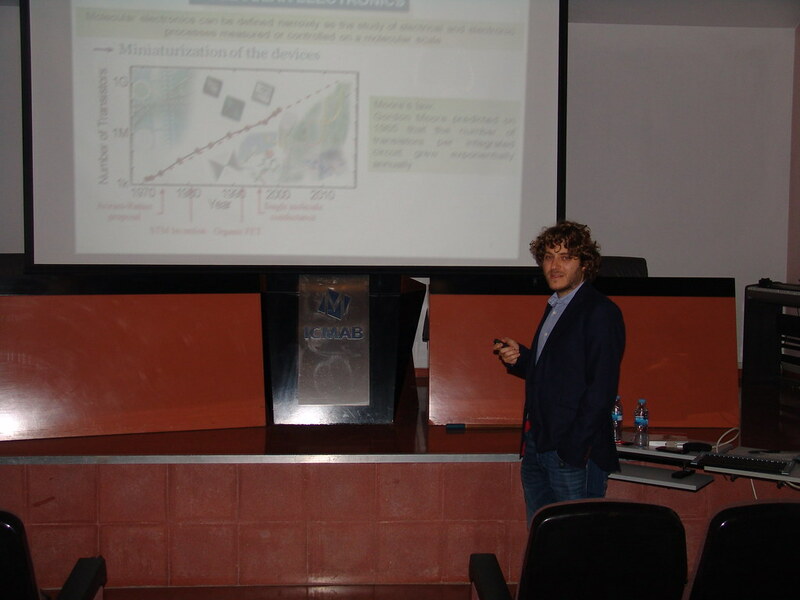 The present Doctoral Thesis is framed in the field of molecular electronics, specifically is focused on the development of new molecular electronic devices and on the study of the electron transfer phenomena associated to them. We exploit the properties of polychloro thriphenylmethyl radical (PTM) molecules to explore the charge transfer mechanisms involved in many different systems containing PTM derivatives. In the first part of the Thesis, we have described the study of the charge transfer process through two different families of molecular wires, oligo vinylene-thiophne (nTV) and fused oligo-pphenylene vinylene (nCOPV), connecting two PTM moieties acting as electron donor/acceptor in mixed valence systems D-B-A. These systems were fully characterized by different spectroscopic techniques in their neutral, mixed valence and oxidized states. The mechanism for the intramolecular charge transfer through these wires was elucidated. In the second part of Thesis we have reported the synthesis of a family of PTM derivatives containing a thiol terminal group connected to the PTM through an alkyl chain with different length, able to form self-assembled monolayers (SAM) on gold substrates. We have studied the charge transport mechanisms through PTM SAMs contacted by eutectic gallium-indium electrode and scanning tunneling microcopy, in their different redox states. Finally, in last part of the thesis we have reported the study of the electric and magnetic properties of two PTM derivatives in gold and HOPG single molecule break-junctions. On gold PTM break-junctions, a Kondo peak was detected indicating that the localized magnetic moment of PTM radical interacts with conducting electrons.